BOULDER, Colo. (BRAIN) — The International Mountain Bicycling Association (IMBA) and the Walton Family Foundation are partnering to present new Trail Labs educational programming and matching Trail Accelerator grants to bring more trails to communities across the U.S.
Barnett Bicycle Institute's Jeff Donaldson says recent industry reports point to the importance of investing in technical training. SPOKANE VALLEY, Wash. (BRAIN) — Paul Swift has sold the majority interest in BikeFit Systems LLC and formed CyclePoint LLC. The new company is the exclusive educational provider for BikeFit Systems and will offer BikeFit Level 1 and Level 2 courses online. LEXINGTON, S.C., & LEVIS, Quebec (BRAIN) — Hawley-Lambert launched an online dealer staff training platform for all its North America accounts. Called HLC University, the platform is hosted on both the Hawley and Lambert dealer websites. COLORADO SPRINGS, Colo. (BRAIN) — Beginning this month, Barnett Bicycle Institute is introducing new curriculum to its core Bicycle Repair and Overhaul class. The BRO course is an 80-hour professional mechanic's training. ASHLAND, Ore. (BRAIN) — The United Bicycle Institute has announced an updated curriculum and manual for its 80-hour Professional Mechanics and Shop Operation class. BLOOMINGTON, Minn. (BRAIN) — QBP has announced the 2018 winners of the women's bike mechanic scholarship. BOULDER, Colo. (BRAIN) — A new 20-video series to help retailers teach staff the basics of customer interaction is now available online. The one-minute Customer Satisfaction Training videos cover everything from basic greetings and manners to more specific topics like merchandising and selling service. SAN JUAN CAPISTRANO, Calif. (BRAIN) — Interbike said it has completely revamped its educational content offerings for its 2018 show. Headlining the show's content will be keynote speaker John Venhuizen, the CEO of Ace Hardware Corporation. COLORADO SPRINGS, Colo. (BRAIN) — The 12th edition of Barnett Bicycle Institute's Manual DX is a 600-page update to the existing manual, bringing the total manual size to 14,000 pages. 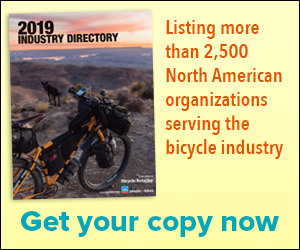 Jeff Rowe, vice president of the Professional Bicycle Mechanics Association, says a trained service staff can turn lost sales into opportunities. Where are you and your staff, at the IBD, getting technical training on an ongoing basis?